Today, President Trump signed an executive order to make changes in the health insurance marketplace. 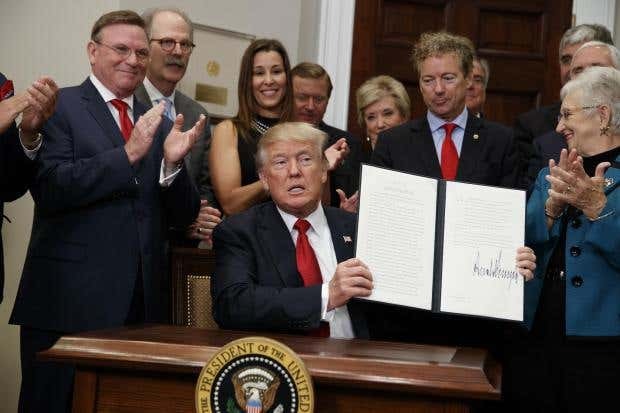 The Executive Order mainly addresses three areas and goes a ways towards the Rand Paul concepts. 1. Association Health Plans. Health plans sponsored by an association could be sold to groups who are members of the association. These plans would not have to meet ACA (Obamacare) essential benefits and coverage mandates. This could reduce premium costs. 2. Selling Across State Lines. Association health plans could be sold across state lines which, in theory, could reduce premium costs. 3. Short-Term Health Insurance. Currently these plans are only available for 90 days or less. This EO would restore short-term plans to a longer period (six or twelve months depending on state). Prior to the rule change under Obama HHS/CMS, short-term plans in California were limited to six months duration per enrollment. I suspect there will be some fighting over this executive order. California Insurance Commissioner Dave Jones has made it clear he does not support this. This should be fun to watch. Stay tuned to my blog for updates on this executive order.